Half length oval portrait in clerical dress, with decorative scroll-work above and a coat of arms below. Inscribed “D.Loggan ad Vivum delin.”. The oval portrait surround has the text: “RANDOLPHUS BATHURST M.DR. ECCL. CATHEDR. WELLENSIS DE CAN. REG. MA. TI A SACRIS COLL. TRIN. PRAES ET ACAD. OXON. VICECANCELLARIUS 1676”. 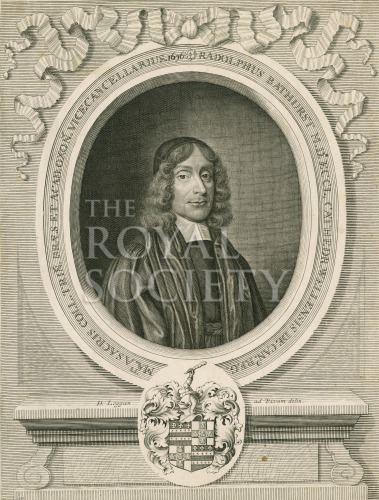 Ralph Bathurst was elected a Fellow of the Royal Society in 1663. Noted in Catalogue of the prints in the possession of the Royal Society, by Henry George Plimmer FRS (1856-1918), manuscript, p.8. J.P.Gassiot Collection, purchased 1878.